It has been six long weeks since the Lenten season began. Five long weeks since I last wrote. 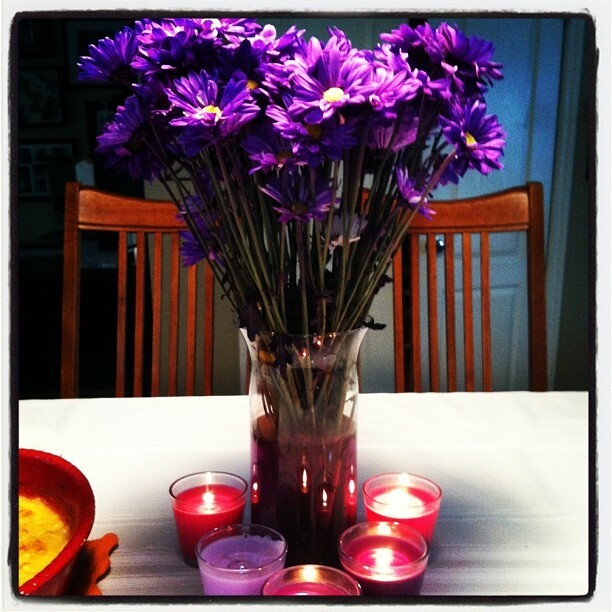 Perhaps you thought I had added “writing my blog” to the list of distractions I was giving up for Lent. I didn’t, but it might as well have been. Since I am banned from Facebook, this is what I had to say on Instagram last night. Sayonara Lent 2014. I love the color purple but I won’t miss you a bit. I will not miss Lent 2014, AT ALL. In fact, Sunday can’t come soon enough, because, for me, this Lenten season was a debacle. I set out with high standards and even higher hopes, but I stayed put in the reality of my life. Though I couldn’t articulate it when Lent began, I think I had a subconscious idea of what would happen over these six weeks. By stripping away so many of my “distractions,” I would open up more time and space for silence and contemplation. I would become more centered. My writing would flourish and so would my relationships. I would begin to attain the holy grail of sevens, what enneagram scholar Russ Hudson calls “sober joy;” joy created not by a circus of stimulation, but by the simplicity and beauty of the present moment, satisfied with and who and wherever you are. There was nothing wrong with the vision, but the goals I set for myself are a life’s work, not something that can be attained on demand, or through a sheer force of will and self-discipline in a pre-set period of time. It took me a while and some help from Tim to see it however. For the first several weeks of Lent, I had vivid nightmares. The details were varied, but they shared the same theme: bad things were happening and I had no control. I couldn’t fix anything, or affect a positive outcome. I simply had to experience the chaos in a visceral manner. I would begin my days in a cold sweat, mourning the losses I experienced the night before. Though the dreams eventually abated, the days I thought would open up before me quickly filled with other challenges. I could explain them all here, but the bottom line is that they were just part an every day, ordinary life – the one I didn’t magically escape on my way to my desired “mountaintop” experience. Last week, Tim and I needed to have a talk. After dinner, we drove to the beach and watched the sun go down and he told me what I already knew. I began this Lenten journey, hoping to become a different person. The problem was that I didn’t consult the person who always journeys with me. This Lent was not a picnic for him. He slept next to me while I tossed and turned at night. He woke with me in the morning and saw the fear in my eyes. He came home at night to someone whose stressful days were unrelieved by the innocent pleasures of a diet soda, two chapters of a good book, or a funny story on Facebook. He lived with a struggling, sadder version of his normally happy wife. The changes were largely of her own making, in the name of her God and ironically, they were intended to make her a more “joyful” person. Tim reminded me that he loves me “as is,” not that I can’t grow and change, but that I don’t need to be different than I essentially am. Giving up one or two of my “go-to” distractions might be a healthy practice, the equivalent of a Weight Watchers plan for the soul. Giving them all up worked on me like a crash diet. Like an anorexic counts calories, I counted every distraction and every moment I wasn’t soberly joyful as a shortcoming. The guilt and sense of failure continued the downward spiral. Don’t get me wrong. In every week, there were moments of joy, peace and laughter and I tried my best not to be legalistic about the process. When food poisoning laid me out for 36 hours, I read A Fault in Our Stars, one of Keara’s favorite novels. When Tim and I went out, I would join him in a beer. I looked over Keara’s shoulder a couple times so she could show me a great picture on Facebook. My Lenten experience is one I won’t soon forget. Like most failures, it was brought on by a confluence of good intentions and arrogance. I thought I could manufacture my own resurrection experience by knocking off some version of me who relied on little things to make her happy. On our sunset walk, Tim reminded me that the world could actually use a few more of those kinds of people; I shouldn’t be in such a hurry to get rid of her. Besides, it doesn’t really work that way. He quoted Richard Rohr who often says, “Don’t try to engineer your own death; it will be done unto you!” Starting tomorrow, I’m going to believe him. 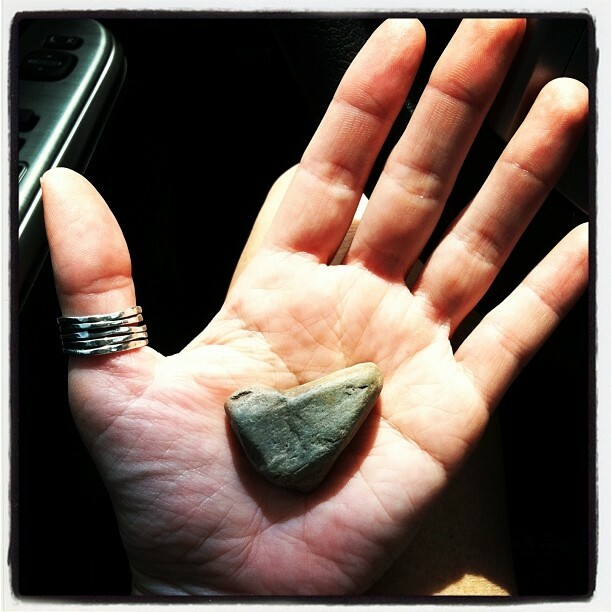 A #Sign of Love I found and held in my hand on Good Friday.